“About Hitler,” the great Viennese writer Karl Kraus wrote as his life neared its end in the 1930s, “I have nothing to say.” It’s hard to feel there’s much to say about Mu’ammar al-Qaddafi’s death either, though that will not stop anybody. A regime that lived by violence and died by violence immured itself in an element that, as Hannah Arendt repeatedly maintained, is absolutely inimical to words. Few outside Libya would disagree that it would be preferable if legality had prevailed, if he had been taken alive, if his crimes could be analyzed and proven in the verbal extravaganza of a trial. Still, when he was seized by angry and loosely-organized men with guns, hundreds of whose comrades he had killed in a nine-month war, it is hard to imagine how any adjective could apply to the remainder of his life but “short.” The transitional council, if it wanted him tried (as is not clear), could perhaps have sent more orders — more words — to its military to keep him living. It’s clear from the shouting men in the existing videos of his capture that they knew there were such commands. But it was as almost-inevitable as in Chekhovian dramaturgy that someone in the scene who had a gun would use it. I am still not quite sure what I think about the Western intervention. I want to know — a figure still undetermined — how many Libyans died in what was supposed to be a surgical incursion, and turned into a prolonged civil war. Still, while it is easy to identify virtually any industrialized-world action in the Middle East as motivated by oil, in fact this one seems more disinterested. Ever since the West decided Qaddafi was a decent fellow to deal with, oil had flowed from Libya quite placidly; the cheapest and surest way to ensure its unabated egress would have been to ignore the rebellion tacitly, and let Qaddafi win. And — despite the hilarity of Qaddafi’s claims that bin Laden was feeding hallucinogens to the rebels — it was true that al-Qaeda affiliates had for more than a decade been among the opposition to Qaddafi, making unseating him something of a risk from the perspective of US obsessions. Foreign policy, particularly US foreign policy, is never altruistic. But this looks like a decision in which some kind of moral calculus competed with political calculation. I gave a paper last week on, among other things, body politics in the Arab Spring. 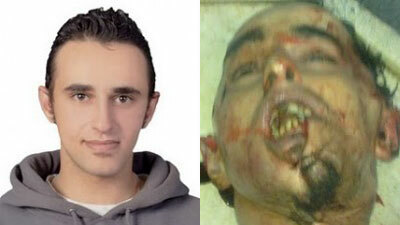 Mohamed Bouazizi, who set fire to himself to protest Tunisia’s dictatorship, and Khaled Said, tortured brutally to death by Mubarak’s police in 2010, became vital figures animating the respective oppositions. Their bodies, burned and mutilated, themselves turned into symbols of resistance to the state’s power. And the palpability of their deaths stood in contrast to the vast, metastasized images of themselves that the dictators pasted everywhere. 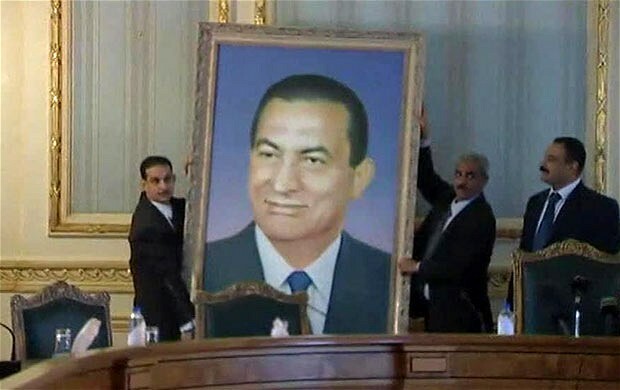 On every corner were gargantuan posters of Mubarak, Ben Ali, Qaddafi looking Botoxed to an unbelievably embryonic youth, stylized idols more airbrushed than a L’Oreal ad. Those were phantasmagoric bodies, suddenly confronted by the tangible bodies of tangible people that rose to depose them. Ghost faces against real faces; the unreal and duplicitous against the living and the dead; a ghost corporeality against human demands and needs. Fake existence faded before the weight and strength of actual lives, whose final mark of actuality was their vulnerability to death. 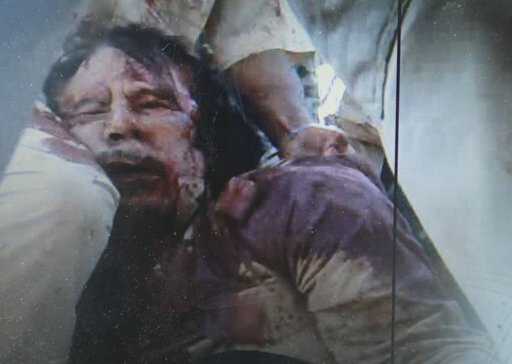 Of all the surrounding newsbits that came with Qaddafi’s killing, my favorite was the announcement that when the transitional council tried to determine for certain this was his corpse, by DNA-testing hair samples, it didn’t work. 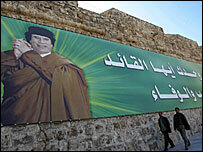 Even in the last extremity, huddling in degradation in a drain, Qaddafi couldn’t be wholly real. He wore a wig. This entry was posted in Human Rights, LGBT Rights, Politics and tagged Hosni Mubarak, Khaled Said, Libya, Libyan revolution, Middle East, Mohamed Bouazizi, Muammar al-Gaddafi, Qaddafi by scottlong1980. Bookmark the permalink. Very eloquent essay. Is this a Scott Long blog? I couldn’t find your name anywhere. The only thing missing in here, I think, is recognition that Libyan rebels asked, repeatedly, and from the beginning, for Western support to topple Quadaffi. That made this event qualitatively different from every other intervention in the Middle East by the West. Sure, even so, there are conflicting and selfish interests just under the surface. But there is already so much over which we can be appropriately cynical; I am happy to set cynicism aside when it merely reassures me, rather than illuminates world events.